There's a new airline in Canada, and it's looking to serve travellers flying to Europe and the Caribbean. Air Canada announced the details behind its low-cost carrier — Rouge —Tuesday morning in Toronto. The carrier is set to take flight starting in July using four planes from the company's current fleet: two Boeing 767s and two Airbus 319s. Rouge will be flying to Greece, Italy, Scotland, Jamaica, the Dominican Republic, Cuba and Costa Rica. These destinations were either not previously offered by Air Canada, or weren't profitable enough to maintain with any of Air Canada's other carriers. "With leisure time at a premium, Air Canada Rouge will combine affordable fares, great service and choice leisure destinations with those benefits offered by Air Canada and Air Canada Vacations that are valued most by vacation travellers," said Michael Friisdahl, president and CEO of Air Canada's Leisure Group at the conference in Toronto. Like a present under a Christmas tree, Air Canada has kept details of their carrier under wraps for months, though according to the Toronto Star, Rouge will eventually ramp up the number of planes to 50, some of which include Boeing's 787 Dreamliner aircraft, set to debut in 2014. Pricing has yet to be determined, but Air Canada is introducing special introductory fares until Christmas Day. If flying from Toronto, travellers can expect prices ranging anywhere from $269 for a one-way ticket to Kingston, Jamaica and as high as $949 for a round-trip to Venice, Italy. The prices are comparable, or slightly lower, than currently available fares, though these are carried out in conjunction with other airlines, like Lufthansa. Passengers flying Rouge can also expect two classes of seats on the Boeing 767 planes — what Air Canada is calling Rouge Plus and Premium Rouge. Rouge Plus seats will feature additional legroom, while Premium Rouge seats tack on "additional seating comfort, space and enhanced meal and beverage service", according to an Air Canada press release. Passengers flying on Rouge's Airbus A319 jets will only have the option of Rouge Plus seats. The National Post is also reporting these planes will be the first in Air Canada's fleet to feature a wireless in-flight entertainment system that can stream stored content to personal laptops and other electronic devices. 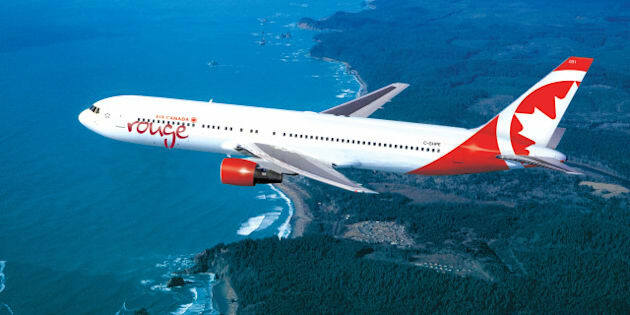 Rouge is expected to go head-to-head with other low-cost carriers like WestJet Encore, though Encore will only fly within Canada. Will you be planning on flying to Air Canada rouge in the future? Let us know in the comment section below or tweet your answer @HPCaTravel.